In ‘Identity: Part–1… ’ we dealt with Shivnath Thukral (ST) equating MediaCrooks (MC) with terrorists. Since that post Thukral and I have exchanged messages on Twitter. Considering he used screen-grabs from my Twitter page in his presentation at IndiaSocial he had the option before his speech then too to reach me and interact. He did not. That itself shows pretty clearly that he made his presentation without bothering to fact-check his theories. Never mind. In the Twitter exchange on September 14, ST has offered a debate with me and I have accepted. I will write a separate post on that later. In this part let’s examine what bothers ST and so too MSM and whether MC is reachable. Whether MC is responsive and yeah, whether the crook is a secret, veiled terrorist. That MC exposes the spin and lies of MSM like many other bloggers is now bothering them. But of the thousands of accounts on SM, Thukral singles out MC to slander by equating him with "Terrorists". Why? Haha! That's a dead give away! 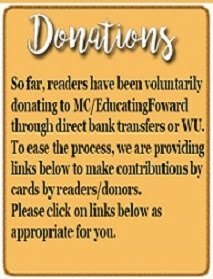 Because MC is 'focused' on the news media and it hurts ST and his friends in the media.We'll come back to him in a bit. Ahem! So Sharmaji has not only read IWJ but is upset about being in the list. He’s also upset being called a ‘Congress Agent’. Well, why would he acquire that reputation? Tarnished by SM? Surely, a part of the population or SM didn’t start out prejudiced against Sharma for him to earn such a title. Then he laments that ‘others’ are not included in the IWJ list but he is. Sharma is not the only one to be blamed. If he observes closely, almost the entire clan of MSM has become nothing more than propagandists. This perception of many viewers can change only with honest "introspection" and “listening” to feedback and viewers. PagalPatrakar (FakingNews) points out that TV channels and Newspapers never hold meetings to discuss feedback or viewers’ sentiments. And that the only meetings they hold are to discuss the TRPs. He quotes Shekhar Gupta who seems to mention that he doesn't even bother about feedback. Apart from TV and newspapers these media celebs also want to rant on Twitter and SM. They want the best of both worlds. They would any day like to see the SM dead or at least the virtual death of some of its users. It’s a nuisance and a hindrance that is now constantly challenging them. That’s what bothers ST too. I’ve already established that ST had many ways of reaching MC but he didn’t bother. I have a surprise for him and others in the MSM who think like him. Now, here are the questions Mr. Thukral: How in the world did a magazine like SOCIETY get in touch with MC? If MC was “Unidentifiable, Unapproachable, Inaccessible” in your words how did they talk to him? How did they do a Q&A with him? How did they get his pic even? Were they “terrorised” into doing so? Truth is: ST made his presentation with the same terrible lies that have infected most of the MSM, or blissful ignorance. He failed to even bother if what he was saying was fact-checked. Did he research his presentation himself or was it Zakarised? (Written by assistants, that is). Well, does ST now have the courage to stand up and say he was wrong? I leave that to him. Towards the end of his presentation at IndiaSocial ST asks: Do these terrorists have a reason for criticising? Aha! What ST really wants to know is if there are ‘motives’ or any ‘agenda’ behind the criticism, like he had in his "terrorist" presentation. Read the tagline under the MediaCrooks logo ST, it has been there since MC was born. What does it say? “Crooks and liars in the Indian Media are the greatest danger to our democracy”. That’s enough reason and enough motive. No secrets there. MC does also seek to expose those who have embraced the “celebrity cult” in news media which gives them a strange belief that they are “unquestionable” and “untouchable”. MC also lampoons the nepotism in MSM where talentless friends, relatives and spouses are passed off as journos or panellists. According to Wikipedia Shivnath Thukral is now the Group president, Corporate Branding and Strategic Initiatives at ESSAR. Well, he leaves me in no doubt that he’s an expert in “branding”. Folks in the MSM are gifted with "branding" skills - they brand those who challenge them as 'Trolls, Haters, Extremists, Fascists, Anarchists, Communal, Terrorists'. Essar, NDTV, CNN-IBN, TimesNow etc. are brand names. Big ones! 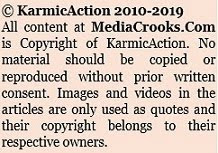 MediaCrooks is also a brand name, a very tiny one but still a brand name. A sarcastic brand name! MC’s readers and users attach certain “values” to the brand; that of Facts, Truth and logic and a generous dash of humour. Readers make their own assessment of each post without having to bother or be influenced by who the writer is. These are values MSM should try. And that’s the way MC stands and is promoted. The author, while not secretive, has no mission to promote an individual or a personality who looks to be a celebrity or a panellist on TV. Because WHAT is written is more important than WHO writes it. Social Media will eventually help society embrace that understanding and not fall for MSM propaganda. Note: The image of the Society article may not be very clear. It's not intended to be. 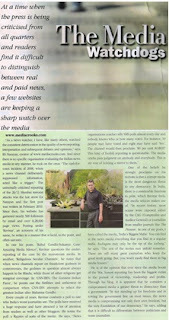 The issue still being current, I shall post a larger image of article towards the end of the month. Of course, one can always buy a copy of the magazine. Very well said Ravi. Real terrorists are NDTV, CNN-IBN, Times Now, Headlines today, Aaj Tak, etc... Let us not forget HT, IE, Hindu, ToI are not far behind. There is a fine line between terrorist and freedom fighter, and is purely depends upon on which side of fence you are. Unfortunately, in India today the person who stands for right cause is branded as terrorist. Look at Anna, Ramdev, Kanchan, Sandeep and even you. No wonder ST, Sharma, Gupta are after you. But you stand for a cause, while they all are paid for what they are doing. I strongly suggest, to take wind out of their sail, please investigate and publish the shareholdings of these MSM. I will not be surprised if they are not heavily funded by foreign money, be it Arab or Church. USA and Europe sell their technology, fashion, Arabs oil, Chinese cheap goods. We Indians sell ourselves. No need to look beyond our MSM and not to forget ST.
On the sidelines. Vinod Sharma and Sekhar Gupta have gone past "Use By" date. Hi, can you please post the link of Shoba De where she has commented about mediacrooks? I have highlighted the part where Shobha De suggests Fareed Zakaria is a thief. As for her copy-paste of my post, I don't think the links are necessary as the case is pretty well known. I will put it up only if there is any denial. American use the expression smoke them out. I wud say let's seal all the rat holes. Still laughing on the facts and points raised by 'ST', 'unidentified, unapproachable'. According to several statistical calculation, in 90% cases MSM don't even mentions the name, identity, photo of the person who collected the data/information. They brand it as "reliable sources", "our correspondent", "Some highly placed sources", "officer requesting anonymity" and so on. They know it clearly that they are untouchables and can tender a minor apology at anytime if caught bitterly. Madama Barkha herself claimed in Radiagate that anonymity, informers, liaisons etc. are part and parcel of journalism. Secondly, it's almost impossible to contact any journalist or editor by phone (email, became a fashion later). :) well after this article, dear Ravi, people are bound to have date problems ! Would be nothing short of a wonder if the debate does happen ! You hit the nail on the head as usual! Well Put up...I feel they r provoking u to come out so that they can attack directly as they have done with several of them. I suggest continue to expose the MSM as u r doing right now. There is nothing to provoke with.. If there were secrets I wouldnt have given that interview. In any case my full ID was always available on the net and anyone could have found it easily. Whatever ST...I still prefer the 'inaccessible' Mediacrooks than the 'accessible' MSM anchors. Ask the 'accessible' anchors questions and they either block you or run away. :) BTW! This Society part is scoop for readers of your blog, ha ha ha. We never knew this. And that too with a picture of yours. Now you are becoming a competition for the Page-3 Plagiarist, the item girl who still has a photograph 40 years old on her blog ;) You should have had an old photograph to be a real competition. LoL!!! Why do I get a feeling, Shiv Thukral will chicken out from a debate with you. Expect him to come out with some lowly justifications for not engaging with you. People who are so used Lied and distorted "to-be-verified" facts lose it before even it begins. If nothing, he will cite no free ride or piggy backing on his "Repute-LoL"
By the way, I bet Shiv Thukral has not taken you on facts. If I were to differ on something that is written here, I wouldn't go about making a Motherhood statement "My discomfort lies here.....Veiled Terrorist et al" in that video, without any basis. I ought to read through what is written here and FIX you. But then it needs me to read through this site and archives which MSM never bothers. They are interested in "Branding" without any basis - make the payer's money matter. As you rightly keep saying, it is not Politicians or Terrorist who hinder Nation's progress and growth - it is these Terrorists in the Paid Media. Fix them and you have done the Nation a great good. If Media mafia like NDTV, IBN, ST and entire clan of media is reading this blog, They must be reading comment section. I want to tell them all, what Ravi writes is our thought of common man about MSM. Its just that, we the common people do not have time, written/spoken skills, analyzing skills to express our perception about the paid media. Its been now more than a year I have been reading this blog regularly. when i had been unaware of this blog or even before i had twitter/facebook account, I had impression of media exactly same what ravi wittily & honestly reiterate in his blog. Ravi's blog is just our reflection, our voice put in better way with excellent written & analyzing skills. Indeed, Ravi is more intelligent than us. Its just that who thinks alike do not necessarily have same acumen & intelligence. I never tried to know who writes this blog. for me What is written is more important than who writes it and He writes exactly same what i wanted to express so why should i bother about who writes it? Well, my point is if this blogger Ravi is Terrorist then I would like to tell entire MSM & congress government, You all are in great danger. there are millions of such terrorist who are living in this country and day by day our clan is increasing. The more we get educated & access to social media, the more we grow in numbers. Very well said. MC is giving voice to millions silent majority. Yes, most of us know what the present day `secular' main stream media stands for. The blog does a meticulous study and exposes the fraud quite beautifully. I don't care if the main stream media goes through the blog or not. You can wake up some body who is asleep but not to one who pretends to be sleeping. The target should be younger generations who falls for the media. We should advertise this blog to as many people we know and request them at least to go some of the articles in their leisure without any prejudice. Superb and brilliant post. A very long time ago, I watched ST on the incredibly boring NDTV Profit. He spoke at supersonic speed; I wonder how viewers ever comprehended those lugubrious monologues. I think the reason behind MSM's name calling is their sense of insecurity. IRS survey shows that Internet as a medium of news is growing at 47% whereas C&S grows at 12% and print media, worse still at 1.3%. MSM realizes that it is just a matter of time that SM overtakes them and they will be rendered irrelevant or at least there will be significant diminution of their clout. Print media went through this phase of helplessness a few years back when TV Channels poached their readers. Now its is the turn of both TV Channels and print media. Instead of just of watching, they are howling. These howls deserve to be dismissed with contempt. And the best way to attack SM is to attack the prominent ones. That explains how you have been chosen. It was around an year ago that I read the MC for the first time, probably while googling something related to Anna Hazare etc. Life was never same after that. Not only was it an eye opener regarding the blatant anti-national media, it also taught us how to analyze situations, assess facts on logic, and look behind the superficials. I was an avid newspaper reader, but that turned into waits for the MC articles. No doubt if the media were half as patriotic as MC, the filthy and corrupt bunch of buffons ruling us would have had to run away long ago. People like Thukral abound around us. Getting a position of any importance in some organization, they start to believe what they say would be accepted as the Gospel truth. They stand exposed thoroughly today, and have got nothing to hide themselves. Hope this process continues, and logically, as the next step, someone exposes the dirt money power which enables them to do so. Kudos to Ravinar, you are doing a fantastic service to the nation. Superb! Here Shivnath Thukral is symbolic of the MSM that castigates the people on Social Media who closely watch and question them when they err. I am sure, Shivnath Thukral will have a very good discussion whenever the meeting, hopefully on SM, with a ring side view to all of us, happens. I hope this article, along with the Society Magazine presenting the person behind MediaCrooks, should set at rest their doubts. Can we expect some fair response, introspection by MSM, and unbiased News at least? I am sure, its tough for many of them to immediately give up their biased views! Its better they go join the party or ideology close to their heart to peddle their views, than use the channels, or print media, which get PAID by the public, including us. Treating the critic as an Enemy is the Worst thing. It can only be done by one who knows he/she is on a weak ground. Ultimately, we all want to see "WHAT is written / said is more important than WHO writes / says it", even with respect to MSM. We don't care if its Barkha, Rajdeep, Arnob, Sagarika, etc. Or, one of their field reporters who really knows what the facts are. I am of the view, Media must every now and then rotate its anchors, or move them out. It removes their cozy rapport with vested interested. That's one way to give a semblance of a fair news a chance. And, a slim chance to save their reputation a bit. Expecting overnight total change is impossible. The media barons control the show, and many of them are in alliance with politicians. Thank you, Ravi. And, thank you Shivnath for making this happen, and offering to discuss with Ravi. We all, the SM followers, and MSM watchers, look forward to that event now. I am happy that MediaCrooks is exposing this MSM. Now iam a regular follower and ask my friends and post your articles in my facebook account. Do you have an account in facebook? I would Request @mediacrook/ravinar to go beyond social media and blog to expose dumbpaidmediaMSM Like start a low price monthly magzine to expose MSM.I also suggest you to Expose Hindi News Channels and Hindi News Papers,because 90% of people in India watch these cheap and lowIQ channels,One need to expose them also.There are more paidNewsMediaCrooks in Hindi News channels and Hindi News papers as compare to English news channels.I also request you to launch your website in Hindi also.please Reply ravinar. Only if the main stream media was honest without any nepotism and completely devoid of sycophany, there would be no need for media crooks. MC tries to tell truth and nothing but the truth. If that's unpalatable to the unworthy then so be it. Hindi News Channels like aajtak,abp news,ibn7 Must also be exposed along with english news channels &thier paid journos.Hindi news papers like dainik jagran,dainik bhaskar,amar ujala,hinduatan etc.also needs to be exposed.because almost all (>90%)Hindi speaking states(up,mp,raj,hp,chgr,jh) watch and read above mention news channels and papers.Hindi news channels are not only paidcrooks but also very cheap and lowIQ.I request you to please write atleat 1-2 post specialy on hindi news channels and hindi news papers.Please provide hindi version of your website.I already suggest above mention to you through your Twitter account@mediacrooks but you newer reply.please reply. 1. I am not a Hindi language writer. 2. If someone wants a translation.. there is GoogleTranslate available although that is not so great. 3. Though Hindi channels and papers are popular they are not viewed across the country. This blog is read by people across the country and the world. OMG,the coffin is sealed! !You are that puny ant that has entered the elephant's ear.Now it is tadap tadap....I feel blessed and honoured to know you thru your words.Am no writer but reading your writeups is like MY hapahazard thoughts have been streamlined and presented for all to know the truth.ok ok am not going to sue you for snatching my thoughts :):P.Hope,Wish and Pray that one day I can meet you in person n thank you for the humongous service you are doing for us and so the nation. Brilliant post Ravi! ST and his gang of crooks have been completely exposed! The crooks in MSM must be breathing fire on ST for this 'a bail mujhe maar' situation ! ST must be dreading and as Suresh has observed he would surely chicken out with some lame excuse! Btw ST would now think twice before using the word terrorist even for a real one :) what a looser! Shivnath Thukral is now the Group president, Corporate Branding and Strategic Initiatives at ESSAR. Well, he leaves me in no doubt that he’s an expert in “branding”. - no surprise there!! they are excellent in copy paste function! !LOL !! Excellent read as always! truly, prefer reading your tweets than the newspaper! I sit back and watch the fun! Thank you ,Ravinar! I strongly believe that the present issue of 'Society' will be oversold because of your sweet surprise. All the MSM & your fans will be rushing to buy it. The demolition of Shivanath Thukral's lies, is complete with this post. ST could not succeed in his attempts to hold Ravinar responsible for the "dubious & discredited" image, acquired by his friends in MSM. An attempt was made to acquire "victim-hood" for ST's MSM friends, by brushing under the carpet, their, "falsehood, lies, & blatant partisanship" exposed by Ravinar. ST's frivolous allegation of Ravinar as "motivated, unidentifiable, unapproachable, has been proved false. The crooks in the media are rattled by Ravinar's consistently hard-hitting, well-researched, humorous and satire filled expose of their lies. If one sees the expression of "Vinod the smirk", in the video, it is clear he is "stung and agitated" by his inclusion into the top 10 worst journalists. In this information age, Vinod Sharma wants us to believe that, physical presence at a Congress "chinthan Bithak", will make one a Congress agent! Thank you. Whether @mediacrooks is anonymous or not, the crooks in the media can no longer hide. Dear Mediacrooks, you are indeed a terrorizing the unscrupulous MSM men and women alike and 'Terrorist' is an apt title for you conferred by your "dear" media men. Hamamboy will drown his sorrows on OldMonk together with the Bimbo wife, who is also an actress on tv journalism. The HAMAM BOY and the BIMBO WIFE what a comparison. Sometimes I wonder y he married her in the first place. i have seen the twitter exchange. Pretty funny. the exchanges itself proves his theory wrong that MC can't be reached. Can't help but notice that none of the news channels gave much coverage to the riots in ghaziabad started by a mob belonging to a certain minority community. i mean how far is the place from their headquarters at noida film city! These third grade Media jouranlists always have vultures eye as where to go or not to go. We the toppers choose another profession whom these beggers control through their political masters and babus. This notion has to change. Merit has to prevail in order to save the country. The people by chance are controlling the masses with choice. This is very disastrous for the thriving democracy like ours. The Dharma says that in MahaBharata their were two advisors the Great Krishna and the Vidura Ji. Krishna was advising Pandavas and the Vidura to DhritRashtra ie Kaourava. We know the fate. So people by chance are to be at periphery and the by choice are suppose to be in. Really a great effort to accomplish this with turmoil of 60 yrs of the Khangressi and Vampanthi mind set. I will keep spreading your word too, the lone sane voice in this gutter infested medium of news these guys call themselves. U John Galt .. who are demolising the MSM Ruled India. Thukral himself forget that some body is observing them ..only he told about Hayward that he was being observed. Hail Social Media. Thukral tried to burn the tail of mediacrooks by terming him as terrorist and inaccessible etc. With that spark, mediacrooks has put the Lanka of mediapeople on fire. The fire is spreading, many media people are feeling chocked up. Hope their lies spread this fire more, and let this lanka be burned down fully. Great Going Sir. You will get many more such awards!!. I support your most of view on MSM. Can you put up a readable scan of the article now?? It is hard for people outside India to get Society. Please oblige. I'm a new follower of this blog. I just want to know have you written the post about the debate you'd with Thukral. Gurudev!! Aapka me hridaya se charan Bandan Kartu Hun! What a master piece have you written. The future generations will remember about your writing skills and thought process .You ahev put up each and every presstitute to his deserving place . I am sure that a few of the known faces from twitter were unable to make to this list like Aana AyyuB,KhavishKhumar etc. The hats off to NDA Govt at centre to ensure their al round presence. Modi ji has surely sharpen their skills in all spheres including Danda from public.